Far-left party will now allow potential MKs to be selected through open primaries, in major win for Meretz head Zehava Galon. 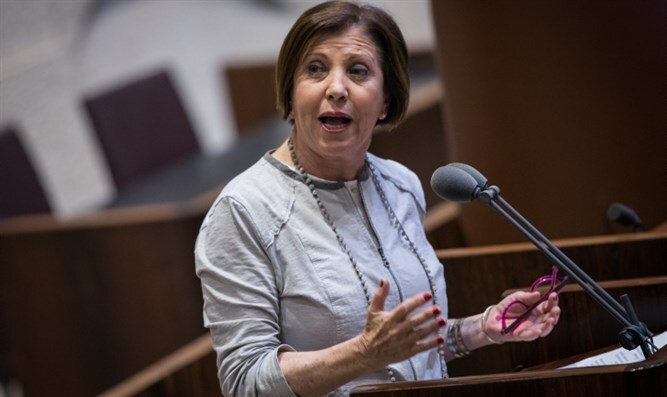 The far-left Meretz party has decided to elect its MKs by using a direct primary system, after months of wrangling among party members that saw party head Zehava Gal-On resign from th e Knesset. The party had previously selected its Knesset list through a complicated two-tiered system, in which party members would elect representatives who would decide the Knesset list amongst themselves. This system had come under attack in recent years by party members, who pointed to its non-transparent internal elections as the reason for Meretz's poor electoral showing. On Thursday, Galon came to an agreement with MK Ilan Gilon, who stipulated that anyone joining Meretz up until 30 days before its March 22 primaries can vote for its representatives. Galon, a fierce proponent of direct elections, had resigned from the Knesset in October in order to devote herself to rehabilitating the party and vowed to change Meretz's method of electing representatives. "I love the Knesset, but I love Meretz more, and I know that if Meretz does not open up, Meretz will cease to exist," Galon had said. "I am convinced that my resignation from the Knesset will allow me, as Meretz's party leader, to concentrate on advancing 'open primaries' and turning Meretz into a large and accepting home for all those who believe in our values." Once a major force in Israeli politics with a dozen seats in the Knesset and power ministerial positions including the Education Ministry and Communications Ministry portfolios, since the 1990s Meretz has declined to just five seats and has not been a member of any government since 2001. Meretz, which was formed in 1992, was the political union of the Ratz: Movement for Civil Rights and Peace party - a small, radical-left faction led by Shulamit Aloni and Yossi Sarid – with the secularist Shinui party and Mapam, one of the two Labor factions in the early years of the state before its merger with Mapai. Shinui broke away in 1997, reestablishing itself as an independent party.